Why Global Montessori Plus (GMP) at GIIS? 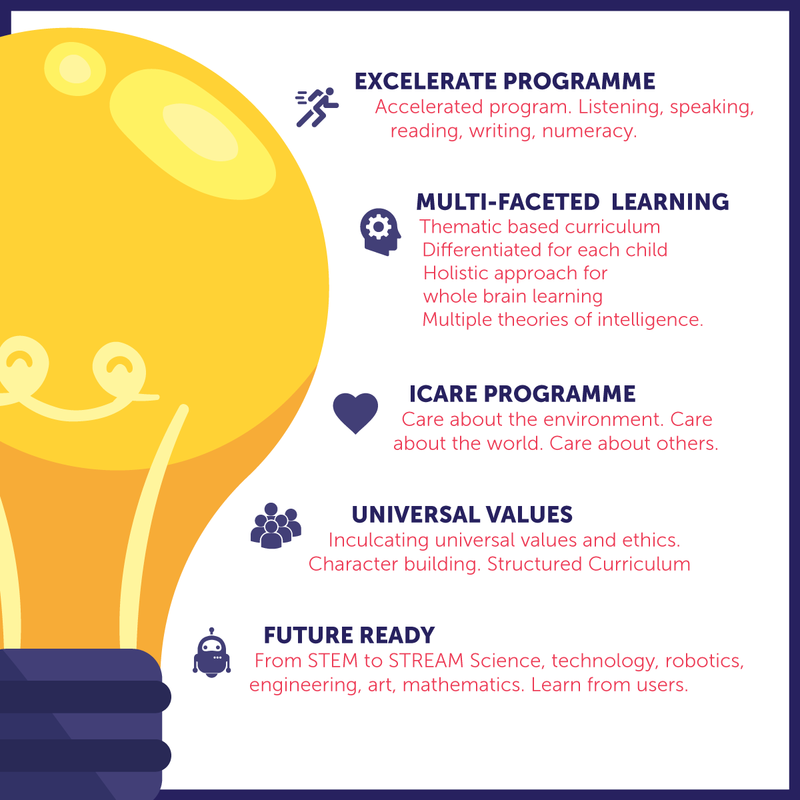 Why Global Montessori Plus at GIIS? GIIS blends high-quality in-house teaching techniques with the philosophy of world-renowned educator, Maria Montessori, in order to help young children reach their fullest social, emotional, and intellectual potential. At GIIS, we offer the Global Montessori Plus Programme, an award-winning programme that offers a blend of the reputed Montessori approach with best practices of modern pre-school education. Pioneered by GIIS, this is the only international pre-school curriculum of its kind and rests on five solid pillars that will give our pre-schoolers a strong foundation in their student life. Focusses on thematic learning which aims to enhance multiple intelligences in every child. Recognising that each child is different, the programme is designed to nurture inherent personality traits by addressing all eight intellectual capacities of the brain. This programme is aimed at sensitising children towards the community and the environment. Participation is key to developing bonds and hence under iCare children are encouraged to get involved in activities that call for interaction with community members or the environment. Children should have the freedom to make choices about what, how and with whom they want to play. It teaches them skills like co-operation, management, independence. GIIS understands the benefits of play not only on physical, socio-emotional, cognitive growth but also its effects on numeracy, literacy and other aspects of development. Has been designed to give an early start to young children to key disciplines of the 21st century. By introducing students to the fun side of Science, Technology, Robotics, Engineering, Arts and Mathematics, we attempt to inculcate in them a love for these STREAMs in a fun and enjoyable way. About "The Plus", GMP's compelling value proposition lies in its customisation of Maria Montessori's method through the integration of original theory and contemporary research and insights. Infusing the fundamentals of formal learning with the latest innovative learning tools, our methodology offers unique development opportunities for our students. Over and above academic excellence, our award-winning 9GEMS framework also promotes values like discipline, creativity, sportsmanship, and respect – many based on universally admired teachings. Quality education is the birthright of every child. This is why we have steadfastly kept our fees moderate while offering best-in-class teachers, facilities and methodologies. Our admission officer will reach out to you in 2 working days. We can help your children’s education continue in Singapore with minimal disruption. Find out what makes our SMART Campus the most advanced school campus in Singapore.